THE GOAL OF THE GROUP IS TO STRENGTHEN AND SUSTAIN THE RELATIONSHIP BETWEEN CWE ALUMNI AND STUDENTS. THROUGHOUT THE ACADEMIC YEAR WE HOLD SOCIAL AND COMMUNITY SERVICE EVENTS, AND WORKSHOPS. WE FOCUS ALL OUR EFFORTS TO PROVIDE A SCHOLARSHIP AWARD ONCE A YEAR. WE OFFER EXCITING AND VARIED PROGRAMS OF INTEREST TO ITS ALUMNI. THE CITY COLLEGE DIVISION OF INTERDISCIPLINARY STUDIES AT THE CENTER FOR WORKER EDUCATION IS HOME TO OVER 2,300 GRADUATES IN THE INTERDISCIPLINARY ARTS AND EARLY CHILDHOOD. 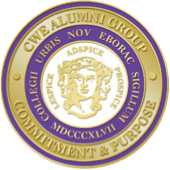 THE CWE ALUMNI GROUP IS DEDICATED TO SERVING THIS COMMUNITY. THIS SITE WILL KEEP YOU UPDATED, INFORMED AND CONNECTED WITH PAST CLASSMATES. All meetings are held at the CWE. Unless otherwise noted.